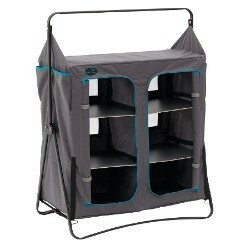 Foldaway kitchen stands are easy to assemble and pack offering you shelf and cupboard space in your tent while packing to a small enough size to be easily transportable. Whatever you want from your camping kitchen, Camperlands offer a wide selection from brands such as Easy Camp, Vango, Outwell and Sunncamp to ensure there is always something to suit. 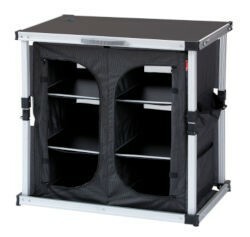 Keep your tent tidy with something from our extensive range of storage cupboards. 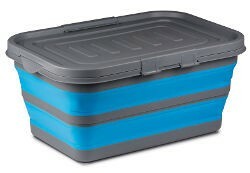 All items will easily fold or dissasemble for easy transport and can be used for storage of clothes or foodstuffs keeping them tidily stored and out of the way. The Easy Camp Avignon is a simple folding Camping Kitchen with a separate food preparation work surface and a low pan shelf. The main cooker stand top is slatted aluminium and safe for use with a camping stove and there's space under the pan shelf for a small gas bottle. This tall camping cupboard is ideal for keeping your tent neat and tidy, with 4 hard edge shelves each side and flat top for extra space. 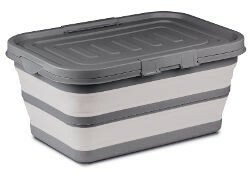 With a max load of 30KG it can take food, clothes in fact anything you need stored away. 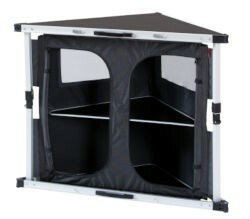 This double cupboard is ideal for keeping your tent neat and tidy, with 3 shelves each side and flat top for extra space With a max load of 30KG it can take food, clothes, in fact anything you need stored away. Folding double camping cupboard with quick erect secure leg joints. Folding corner cupboard with quick erect secure leg joints. Folding single camping cupboard with quick erect secure leg joints. 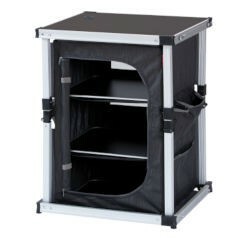 Kitchen windshield to fit to the Kampa Major, Colonel and Commander camping kitchens. The windshield protects the flame on your stove to reduce cooking times and reduce fuel use. The Kampa Chieftain is the ultimate field kitchen. Including a built in sink and spice shelves, this extra large unit provides everything you need to cook up a storm in the outdoors whilst camping, barbecuing, picnicing or even in the garden at home. A large folding kitchen with versatile storage. 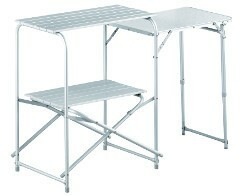 2 work tops give you space for a camping stove and seperate food preparation area making it easier to make proper meals. 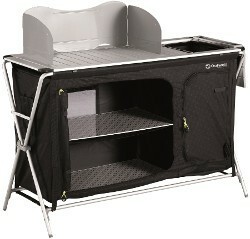 Easy to fold and assemble, the Kampa Commander kitchen is easily transportable. 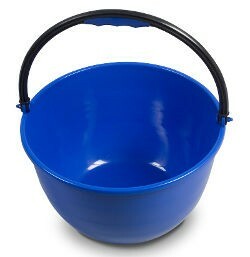 Generous size dishwashing bowl with carry handle ideal for caravanning and camping. 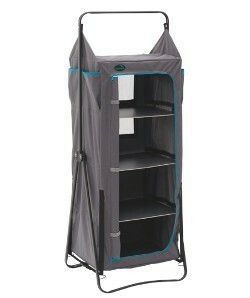 Compact, easy folding tall camping cupboard. The Kampa Florence has a concertina folding frame for easy set up and a solid worktop to provide additional storage as well as the 3 internal shelves. Sturdy folding camping kitchen or cooker stand. The Kampa Major Field Kitchen folds easily into place and has a lower storage shelf, rubbish basket and worktop for food prepration or camping stove. Camping furniture foot pack. 4 plastic feet to spread the load and cover sharp feet on camping chairs, caravan steps and other furniture. Universal Bigfoot protects groundsheets from damage due to sharp feet and stops chairs and beds from sinking in soft ground on campsites. 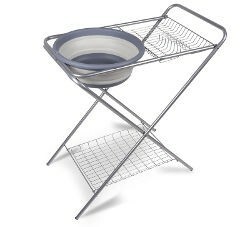 Folding steel wash stand with storage shelf, wire draining rack and collapsible silicon wash bowl included. 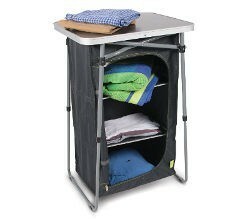 Quick and easy to set-up and dismantle, makes washing up on your site easy.